All transactions are safe and secure with a reliable history in online purchasing behind each of our associates. Buy the Hello Kitty Hats and Beanies to own Hello Kitty clothing and merchandise. If you've found the perfect Hello Kitty shirt but you need something warmer to wear with it, you've come to the right place. This soft white hat is reminiscent of the earmuffs or the Hello Kitty hoodie with ears and red bow. It will put a smile on everyone's face while keeping your head and ears nice and toasty. 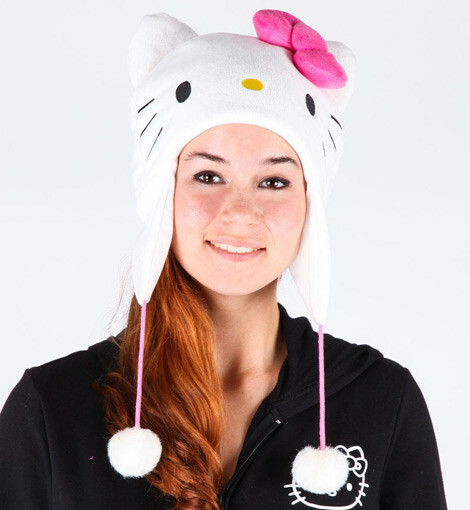 This Hello Kitty hat will also look great with a matching white sweatshirt. Whether you pair them with a hoodie or any Hello Kitty watch, plush doll or stuffed animal, your leading lady will surely appreciate the thought and enjoy the uniqueness of this cozy hat with ears. In addition to the Hello Kitty Hats and Beanies above, browse the Hello Kitty Clothing Gallery for more apparel like men's and women's clothes, kids shirts or hoodies.